Just as Pierce Brosnan’s tenure as James Bond came to an end, the Seamaster he made famous is being replaced by a new watch which, like Daniel Craig, is an improvement over its predecessor in many ways. 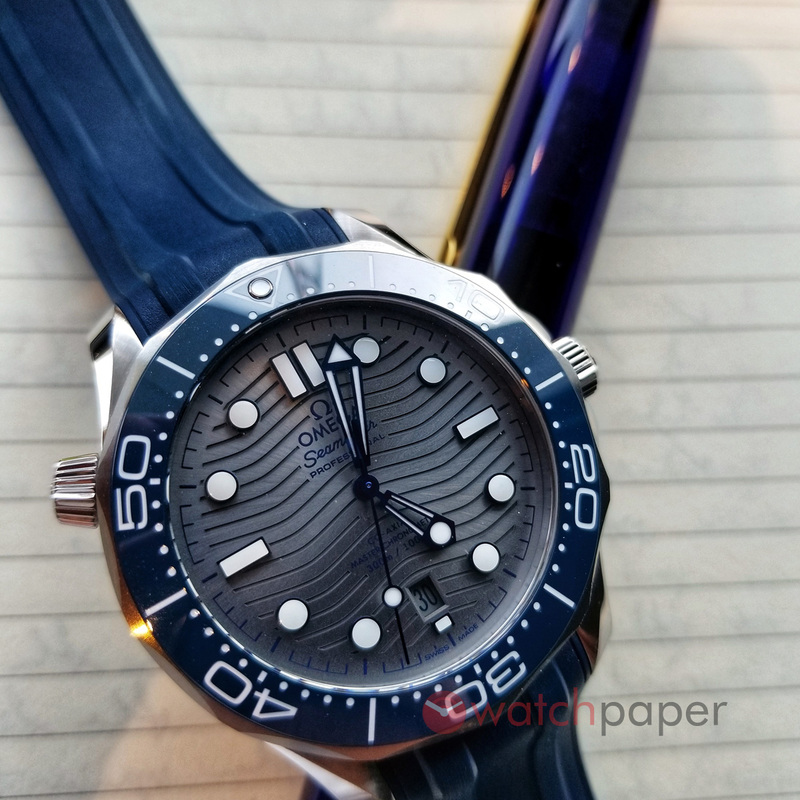 In a word, the new iteration of the Seamaster is “more.” More – but not too much – case, more movement technology, more modern materials across the board, more accuracy, and more dial. But does a seriously impressive spec sheet translate into the refined-but-ready, dressy and purposeful diver that was the previous generation’s character? It depends on which variant (Omega introduced 14 at this year’s Baselworld) you look at. The Seamaster I wore for this review (grey dial with blue bezel and rubber strap) skews to the sporty end of the new line up. While it delivers good looks and extraordinary craftsmanship in its fit and finish, it is somewhat less versatile than the classic dark blue or black-dialled versions on the steel bracelet. My Seamaster was an attention-grabbing watch that was more at home delivering on “sport” part of its marketing designation. To expand a bit on some of the elements we get more of, let’s start with the case itself. Upsized by 1mm to 42mm, the new case retains the beautiful blend of polished and brushed surfaces that made it wearable as more than just a tool watch – the lyre lugs are especially seductive. The underside of the case loses the traditional hippocampus in favour of a crystal through which you can see the coaxial 8800 powering this latest Seamaster. But the most impressive part of the new case was – for me – its thickness or lack thereof. 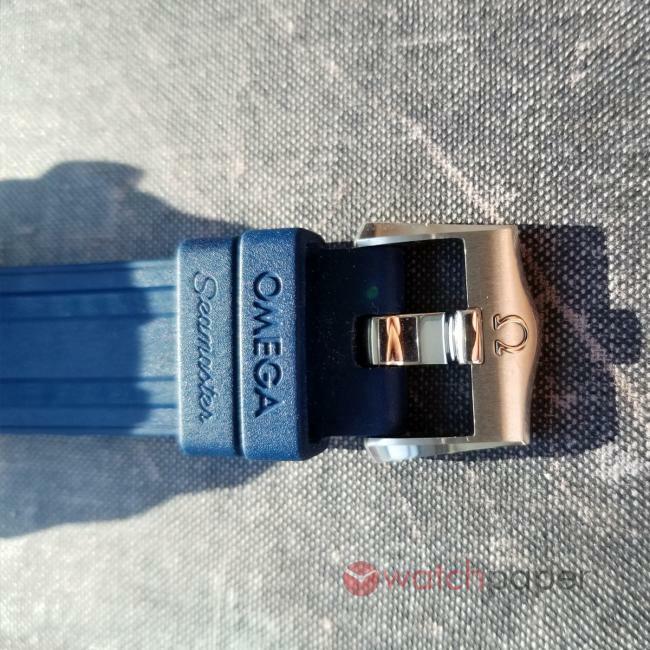 Previous Omegas have suffered in the wearability department because of their height and stretched-oval profile, which made them perch awkwardly on my wrist. Not so with this Seamaster. Omega got the case dimensions right and the watch sits flat and very comfortably on the wrist. This may be due to the 8800’s architecture. The rotor (and here is where the crystal caseback comes in handy) seems to curve more deeply into the movement itself, recovering a few precious millimeters of height that allow for a slimmer case profile and a huge boost to wearability. Adding to my review copy’s wearability was its supple rubber strap. The holes on it were structured in such a way that guiding the tang into the correct sizing hole could be done by feel alone. It’s a small thing, but touches like this and the signed buckle on the band made me look forward to wearing the watch for the day. The new dial re-introduces the wave motif absent in the last versions of the previous generation Seamasters. Larger – much larger – waves are laser-etched into the ceramic dial and, depending on the ambient light are either very pronounced with wide gaps between curves, or in lower light an interesting background for the applied indices. The dial is a polarizing feature. Some loved the return of the waves to the Seamaster, while others felt it was a design cue taken too far. The indices and hands will look familiar to lovers of the older model and the blued steel hands on my version were striking in the right light. The date moves from 3 o’clock to 6 o’clock and is the only misstep in the design. With blue numerals on a grey background, figuring out the date was impossible to do at a glance. Blue numerals on a white background would have fit with the indices and made it much easier to use the complication. Powered by the Omega 8800 coaxial movement, there’s more in the watch’s engine too. METAS, Master Chronometer certification, which I’ve written about before, surpasses existing COSC standards by a considerable margin: timekeeping accuracy, resistance to magnetism and temperature variation, as well as testing under extreme conditions make this standard the one to beat and Omega is making it the standard in their new watches. 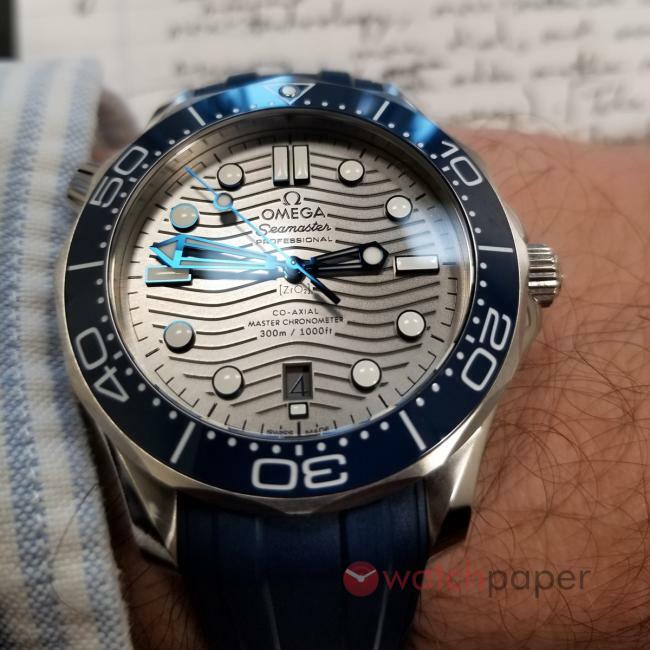 At $6000 CDN, this version of the new Seamaster is considerably less than the Submariner, the watch many collectors mention in the same breath when talking about luxury divers. 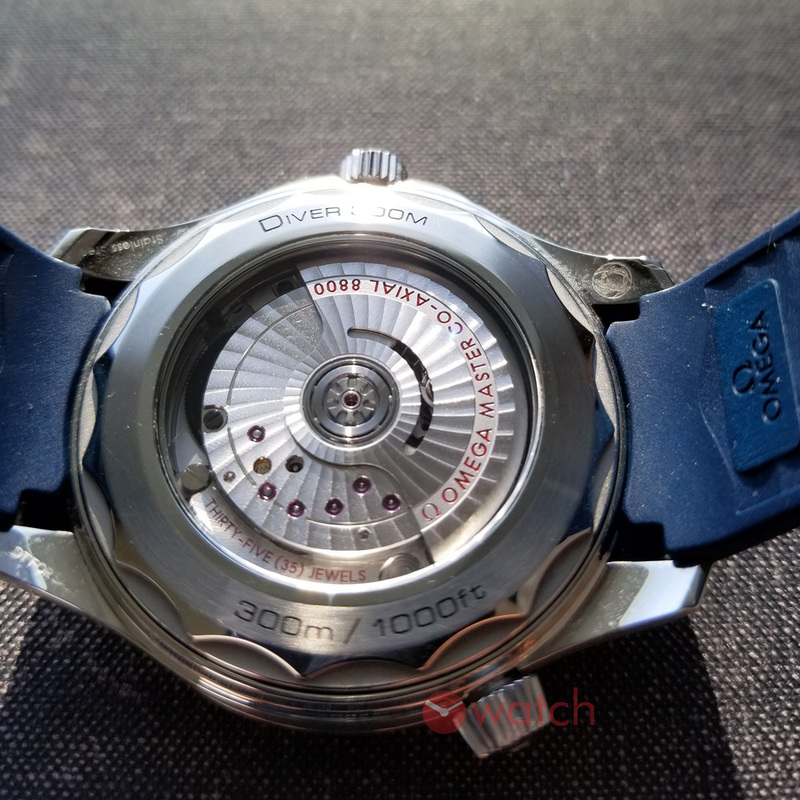 The comparison might be unfair for any number of technical reasons, but as models with long histories they are fairly direct rivals in the imaginations of watch nerds and marketers. The most relevant question about the new Seamaster is whether you like “more.” Does the watch, with its familiar but amplified design exceed the sum of its parts? 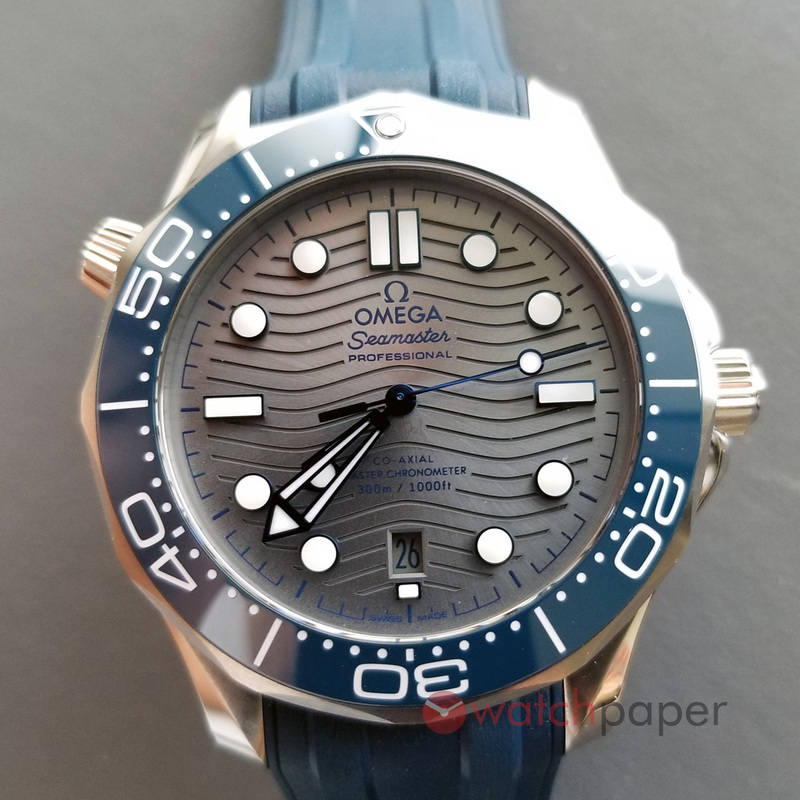 Fortunately, with 14 versions to choose from, Omega has delivered (in at least one of them…mine in the dark blue on steel) your new, iconic, luxury diver.